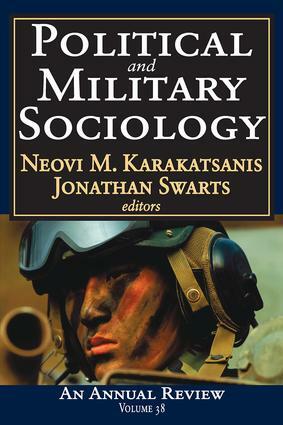 Political and Military Sociology continues a mission of publishing cutting-edge research on some of the most important issues in civil-military relations. In this inaugural volume of the new annual publication, Won-Taek Kang tackles the issue of nostalgia for Park Chung Hee in South Korea, and analyzes why many South Koreans today appear to miss the deceased dictator. Ryan Kelty, Todd Woodruff, and David R. Segal focus on the role identity of U.S. combat soldiers as they balance competing demands made by the military profession, on the one hand, and solders' family and personal relations, on the other.D. Michael Lindsay considers the impact that social contact has on military and civilian participants in the elite White House Fellowship program, and analyzes how social contact affects the confidence in the U.S. military that civilian fellows later show. Analyzing letters to the editor of a local newspaper, Chris M. Messer and Thomas E. Shriver consider how community activists attempt to frame the issue of environmental degradation in the context of a local dispute over the storage of radioactive waste. David Pion-Berlin, Antonio Uges, Jr., and Diego Esparza analyze the recent emergence of websites run by Latin American militaries, and consider why these militaries choose to advertise their activities on the Internet.Political and Military Sociology also includes reviews of important new books in civil-military relations, political science, and military sociology. Included here are discussions of books about U.S. war crimes in Vietnam, civil-military relations in contemporary China, the structural transformation of the U.S. Army, Japanese security policy, American treatment of POWs, the Bonus March, and the GI Bill.The series will be of broad interest to scholars of civil-military relations, political science, and political sociology. It will continue the tradition of peer review that has guaranteed it a place of importance among research publications in this area. Self-Advertised Military Missions in Latin America: What Is Disclosed and Why?